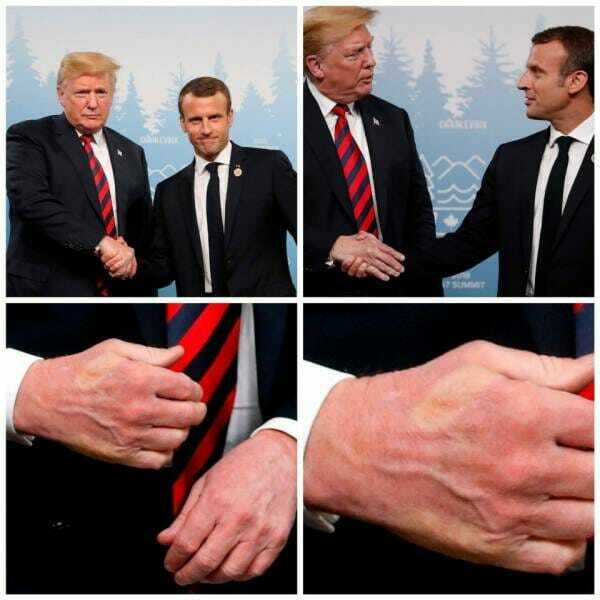 LITTLE MACRON Leaves Print on President Trump's Hand After Tense Handshake... WTH Frenchie? LITTLE MACRON Leaves Print on President Trump’s Hand After Tense Handshake… WTH Frenchie? French President Emanuel Macron challenged President Donald Trump on Thursday after the US president hit the European Union on their unfair trade policies with the United States. It took only a few hours for President Donald Trump to respond. On Saturday, President Trump and French President Macron came face to face in Canada for the G7 Summit and they had another tense handshake. Trump and Macron have a history of tense handshakes.